Do you know REAL GOLD? Pure gold is 100% gold (duh!) However pure gold (also known as 24 kt gold) is too soft for the wear and tear of everyday living. The gold you buy is usually mixed with other metals (like zinc, copper, silver) so that it is stronger and more durable. The percentage of gold in an alloy will determine its karatage. 24kt (or 24K) 100% gold (too solft for durability and strength needed for jewelry. In truth, 24kt is really 99.9% pure gold). Note: Even though karat and carat are technically different, you will often find gold jewelry with the "ct" marking or in its metric equivalent; eg a 22 karat gold piece of jewelry might also be marked "22ct" or "917". Q. Why is 100% called 24kt gold? The amount of karatage in gold is an indication of its gold purity (i.e. amount of gold in the alloy). This amount is measured in 24ths-parts - hence making 24kt pure gold (i.e 24/24 parts of gold). Q. What is the difference between 9kt and 18kt gold? This is a very common question asked and asked again in jewelry stores. That is because, especially in the Western countried, a lot of 'gold' jewelry is sold either in 9 or 18 kt gold. However, even though 9kt gold does have gold in the metal alloy, that low percentage of gold is not considered as 'real gold' both in Europe and United States. The common argument that 9kt gold is stronger and therefore, more durable that the 18kt (or other higher karatages of gold) is not a very strong argument. Afterall, iron is also stonger in metal strength! Q. What is the difference between karat and carat? Karat is a measurement for the purity of gold (amount of gold in an alloy) and platinum alloys. All jewelry that is designated and recognised as real gold (within the recognized karat ranges) will normally have the karat amount stamped on the jewelry piece (normally on the inside band of a ring; on the clasp in necklaces and bracelets). Karat is the established measure of purity in United States and Canada. In other countries, this is complemented (or superceded) by the millesimal fineness system. The word carat originated from the Greek word 'keration' which means 'fruit of the carob' (or carob bean). Carob beans was once used to measure fine gemstones because the carob beans have uniform sizes and were used as weights on precision scales. Today carat is a unit for measurement for the weight of diamonds and other fine gemstones. (One carat is equivalent to 200milligrams or 0.2 grams). Q. How is gold from Asia different from the gold normally obtained from Western countries? You will often find that a lot of gold jewelry from Asia (especially South East Asia) is sold as 24kt or 22kt gold. It has been told to me that 24K gold in Asia is really equivalent to 22K in the Western world. This is probably true because according to most jewellers, pure 100% gold is too soft for long-term wear as it is too soft. I do know that the Asian 24K gold is richer in gold content and softer but still very durable. From babyhood, I have been fortunate enough to be given and have continuously worn 24kt gold rings, bangles, necklaces. And I am not one of those people who are capable of being fashion conscious enough to change jewelry with every outfit I wear. So even tho I tend to wear my gold jewelry continuously (sometimes for years), I have never encountered problems with my 24kt Asian gold jewelry - not wearing out nor breaking. So from personal experience, I fully endorse the Asian 24kt gold jewelery ... if you are lucky to find them. 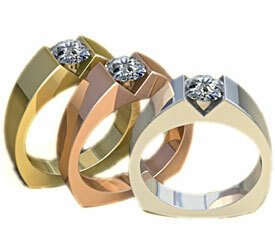 Gold on the market comes in 3 main colours: yellow gold, white gold, and rose gold. Gold in its natural state is always yellow. The chemical symbol of gold is Au. This comes from the Latin word 'aurum' which means 'shinning dawn'. Aurora is also the Roman goddess of dawn. Both a direct link to the warm, yellow colour of gold. Pure gold is mixed with other metals not just to increase strength and durability, but also to change the colour of the resultant gold (alloy). White gold comes from mixing nickel, palladium, and/or other white metals with natural yellow gold - with a resultant metal that looks silver in colour. Traditionally nickel might have been one of the common metals used in creating while gold. That is less true these days as nickle has been found to create allergic reaction in man people. Many confuse white gold with platinum but they are not the same. They do look similar. White gold is a cost effective alternative to the very much more expensive platinum. 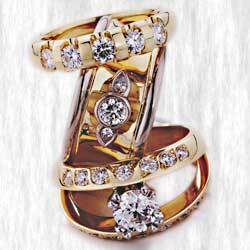 To overcome these advantages, while gold is very often platinum plated, or rhodium plated. Adding copper produces rose gold. Generally, the mixture is 75% gold & 25% copper. Rose gold will be darker (rosier) with higher percentage of copper. Though this is a lovely colour, rose gold will patina over time due to the copper content. As an aside, it is interesting to note that adding silver will give gold a greenish tinge. Even though gold is tarnish-resistant and retains its lustre over prolonged periods of time and will not chip, flake, or corrode, makeup and cleaning products can dull its appearance. So it is advisable to remove your gold jewelry when you go for a swim, spa, or sauna. Chemicals tend to dull the appearance of almost any precious metal. To clean your gold jewelry, using some mild detergent and water is sufficient. Then polish up the pieces with a soft colth.